In time for the 2015 camping season, Cosas AutoSuficientes, LLC (CAS) launches the online sale of THRIVE Portable LED Solar Lanterns. The solar lights were normally sold abroad to those who live in rural and remote areas of the developing world with little to no access to an electrical grid. 3.5 million solar lights have been sold in 15 countries since 2007 prior to online sales. The Solar LED Light is catching attention for its high quality and low price along with the manufacturer’s socially driven business model. 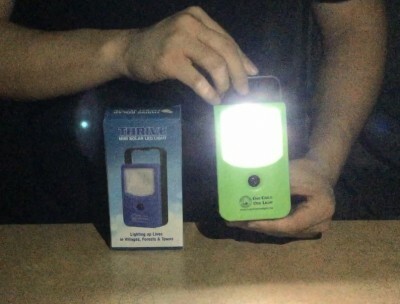 For most online customers, the THRIVE Portable Solar Lanterns are good to keep as emergency flashlights in survival kits as they do not have to rely on external batteries that may end up dying during long periods of storage. Lightweight at 3 oz, small and portable (15 cm x 7.5 cm x 3 cm) – it emits up to 8 hours of bright white light after a full day of charging under the sun. The solar panel is built-in on the backside of the lantern, so no separate cords needed. It’s all-inclusive. Campers would find good use for the solar lights as handy flashlights, as well. For the 2.3 billion who have to deal with regular blackouts or life outside of an electrical grid, the solar lights act more than just flashlights. They provide a cheaper, reliable, and cleaner source of lighting to enable life after sunset, like studying extra hours and continuing entrepreneurial activities. Without solar powered devices, these people may spend upwards of 20% of their meagre incomes on dirty and hazardous kerosene fuels just for light after dark. This in turn deprives them of a chance to save their money and work their way out of poverty. 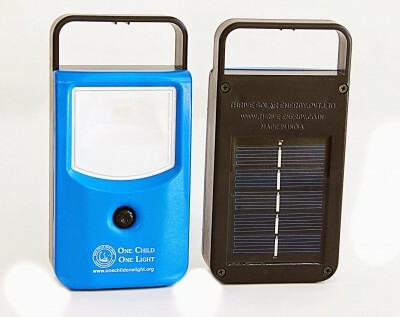 The THRIVE Solar Lantern is touted as the most inexpensive, high quality solar light in the market today. In place of a light bulb, it utilizes an LED light chip invented by Shuji Nakamura, the recipient for the 2014 Nobel Prize for Physics for the invention of efficient blue light-emitting diodes. Nakamura has a special partnership with THRIVE Solar Energy because of their social mission. Nakamura’s LED invention brings the cost down significantly for those who need the Solar LED Light for everyday use, particularly those in the developing world who earn only $2.50 per day. 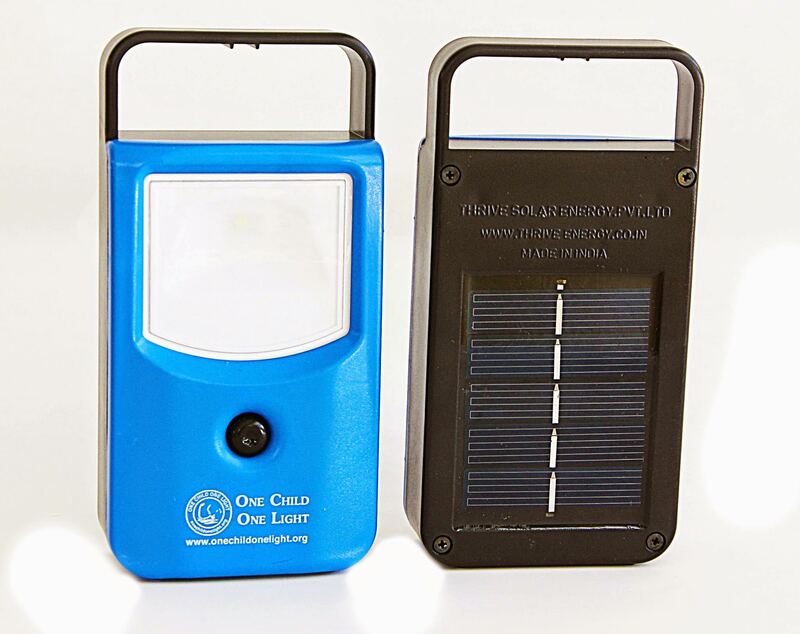 The online sales contribute to THRIVE’s charity, the “One Child One Light Foundation.” The foundation works with local NGOs and governments around the world to donate its solar lights to communities in need. The online sales also help THRIVE sustain its community empowerment business model, in which it manufactures the solar lanterns in places where job creation would impact poverty eradication programs the most. THRIVE supplies as much of its materials from local economies, and has one of the few, if not only, solar devices in the market that does not have to label “Made in China.” “Made in Kenya” or “Made in India” is a proud label to bear. THRIVE allows quality high-tech, green-tech products made right out of India and Africa. By the way, the THRIVE factory in India is run entirely from solar energy.